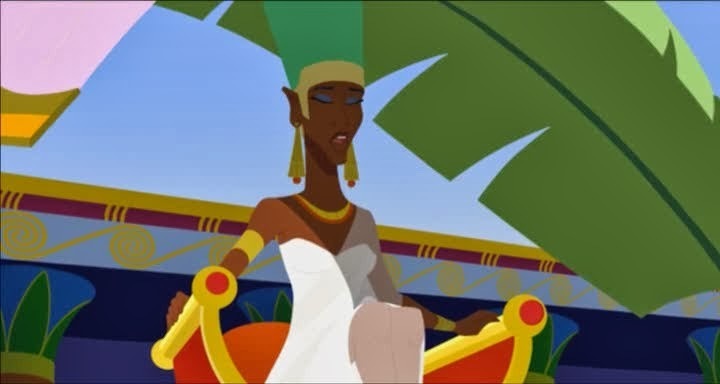 Description: During the reign of Akhenaten, a young princess named Akhesa is a lively troublemaker that escapes the palace ever so often. However, a group of soldiers from the neighbouring nation of the Hittite empire is burning down small settlements in search of gold. Soon, a much larger conspiracy is revealed that will decide the fate of the Egyptian royal family. 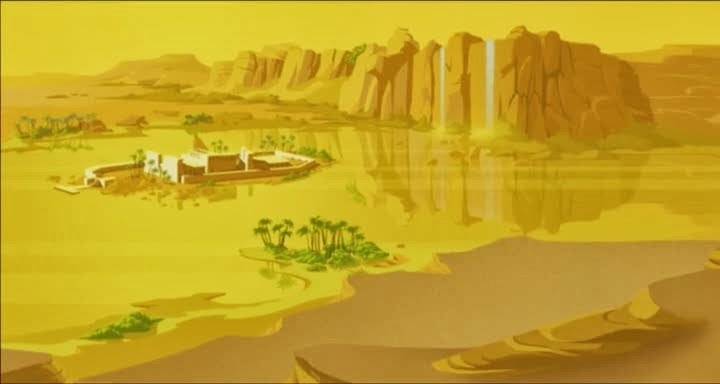 In the period around 1350 BC - 1335 BC (there exists some dispute over the actual dating) Egypt experienced for a brief moment of time nationwide monotheism during the reign of Pharoah Akhenaten in the 18th dynasty. Akhenaten was a devoted follower of "Aten", the disc of the sun. It's not a period much talked about in popular media so the fact that there exists not only a novel about it, much less an animated movie intrigued me. It of course follows more closely the events concerning the crowning of Akhesa, who would take the now famous Tutankhamun as her consort. Normally when studios make these kinds of movies they take a lot of liberties with historical events, and yes this movie does too. However the film still manages to capture a lot of the tense politics during this time period and for what that's worth at least I will give it that. Well done. It's when it comes to looking at the film from a cinematic perspective things start to get a little shaky. The main problem with the film is its pacing. Events will quickly fly by at one time and then another time the film awkwardly takes it time with keeping in shots that could've been told in hindsight or through imagery alone. Exchanges like "Will you see this person" "No I won't" "He will not see you" are just a strange addition to the film and it takes up time that the film should've used on its other big problem: characterization. There are not a lot of characters in this movie, but even so only the two main characters seem to have distinguishable personalities and goals. What is the motivation behind the villains actions? Why did the king decide to outlaw almost all the gods? Things are mostly explained in throw-away lines without any deeper explanation in the context of the actual movie. It's a shame too really, because the film is absolutely drop dead gorgeous to look at. It features streamlined yet expressive character designs, it has a great use of its color palette and the animation is smooth as can be. The music is also very much in the background but it captures the spirit of the moments and you can tell that the creators of this picture was really into making this movie as pleasing to look at as possible. La Reine Soleil could've been a truly great animated movie if more attention was put into the pacing and storytelling of the piece. Unfortunately as it stands, it is a visual masterpiece with very little else to back it up.